The 3rd International European Speleological Federation Camp “Chamois Camp 2011” has come to a close after 10 intense days. The event drew more than 30 participants from 10 countries. Lots of work was completed, including positioning, digging, gauging of water flows on the surface, and exploring, surveying, diving sumps, photographing in the cave. As a result, the Chamois Cave is now surveyed to 10 kilometers (6.2 miles) long and 325 meters (1,066 feet) deep. Future trips will work on more exploration within the cave, opening new entrances and diving in the river. Chamois Cave is located above a waterfall coming out of a cliff near the village of Castellet-lès-Sausses in south-eastern France. 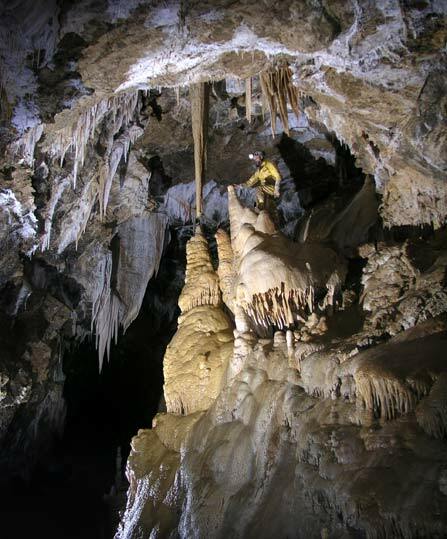 Due the remote location and it’s difficult access few cavers had attempted to explore the cave. Previous attempts were stopped by three successive sumps which blocked the narrow entrance. It wasn’t until 2008 that the sumps were emptied and the cave could finally be explored.